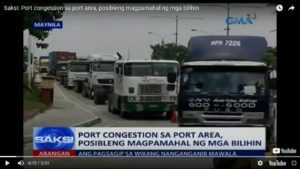 The current port congestion at the ports of Manila is affecting the turn around operations of trucks due to issues of returning empty containers. With this development, it is expected that the prices of imported goods are expected to increase. Balikbayan boxes are expected to be delayed for 4-6 weeks from the original arrival date.